In a hospital in Uganda, 14-year-old Vincent is being treated for cryptococcal meningitis, contracted as a result of AIDS. 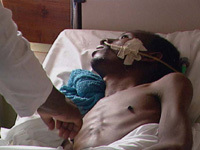 Underweight, frightened and wracked with pain, he is one of literally millions of AIDS orphans across Africa who will die in the next ten years unless life-saving antiretroviral drugs become more widely available. But at current prices, the drugs are just too expensive for most African countries. The fight for affordable drugs in Africa first made world headlines last year when a consortium of forty-two major pharmaceutical companies took the South African government to court over its right to import or manufacture generic drugs to treat AIDS sufferers. After a global campaign by activist groups, trade unions and NGOs, the companies finally withdrew the case in April 2001 -- in what was likely regarded as a humiliating climb-down. But even before the court case outcome, the companies had begun reducing the prices of their patented drugs -- as part of the Accelerating Access Initiative brokered by UNAIDS to provide drugs at a lower cost and training to selected African countries. This program from the City Life series investigates the background to AIDS treatment in Africa, reports of the success of the Ugandan program, and asks why the South African government is still refusing to authorize a national program of treatment for AIDS. The producer of this program has collected extensive resources at www.tve.org/lifeonline/index.cfm?aid=1171.